I recently migrated my desktop back to Windows, and while I’m at work I need to have regular screenshots of my monitor, for investigation and other purposes. I easily found a solution to record desktop activity by making regular screenshots on Ubuntu, and I thought that Windows solutions will be even more. It turned out to be the opposite — they were all either paid or not working/lacking features. Old image files are actually moved to “Recycle bin” by default, in order to be on the safe side — if we have a bug, no files are lost. 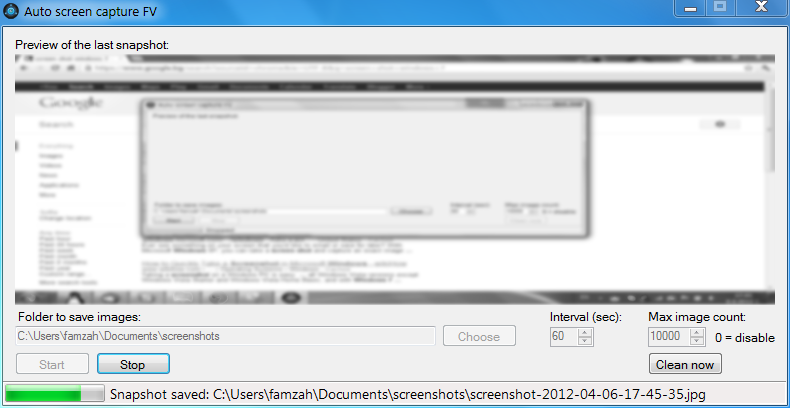 Auto Screen Capture FV has been tested on Windows 7. Categories: Development, Misc | Tags: desktop, open source, record, screenshot, windows | Permalink. why interval must be >10, I went straight to set it 1 and didn’t work. I think it can be cached to RAM first so small interval will work great. Thanks. It doesn’t let you set the interval smaller than 10 seconds intentionally. I couldn’t think of a use-case where someone wants to take a screenshot every second, and furthermore this will fill up the disk quickly. Please explain your usage scenario. I can rebuild the application then and remove this limitation, while substituting it with a warning. I’m trying to record my work (the process I do vfx, animation etc) so I can use them as fast-forward clip when making behind the scene video. Pretty fun thing to do as well. Done. You can now set 1 second for an interval. Please download the new installer and re-install the application. Yeaee, I’ve achieved that by writing an AutoHotKey script along with Greenshot, but your thing is no doubt more lightweighted and easier to use, thank you very much Ivan. 🙂 You’re welcome. Best of luck in 2013! Thanks you saved my day! I was searching for a simple tool like this.